On December 4th, the Obama Administration announced that the US Army Corps would not grant Dakota Access LLC the last remaining easement it needs to drill under the Missouri River at Lake Oahe and complete construction of the pipeline. While this is a big win, the fight is not over! Our solidarity efforts are needed now more than ever. Starting on December 1st, we are launching a Global Month of Actions in solidarity with water protectors on Standing Rock. We call on allies across the world to take action EVERY SINGLE DAY of December. The financial footing of the Dakota Access Pipeline is in jeopardy if they do not complete the project by January 1st. If this deadline is missed, a majority of the stakeholders with contracts to ship oil through the pipeline will be able to renegotiate or cancel their contracts. 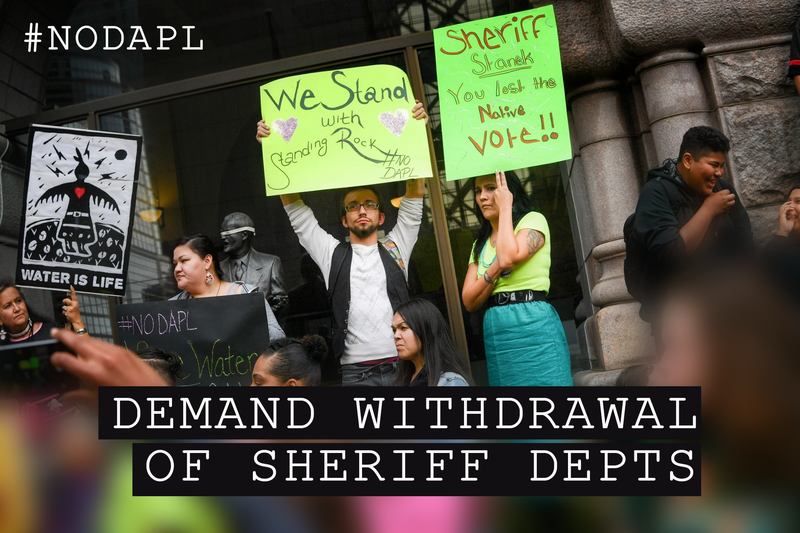 We are asking people to target the banks funding Dakota Access Pipeline and the Sheriff Departments that have been brutalizing peaceful water protectors. Click here to locate a target near you. Actions will appear on this map as they come in. To stay up to date with on going plans for solidarity actions, sign up here! And feel free to email us at actions@nodaplsolidarity.org if you have any questions! 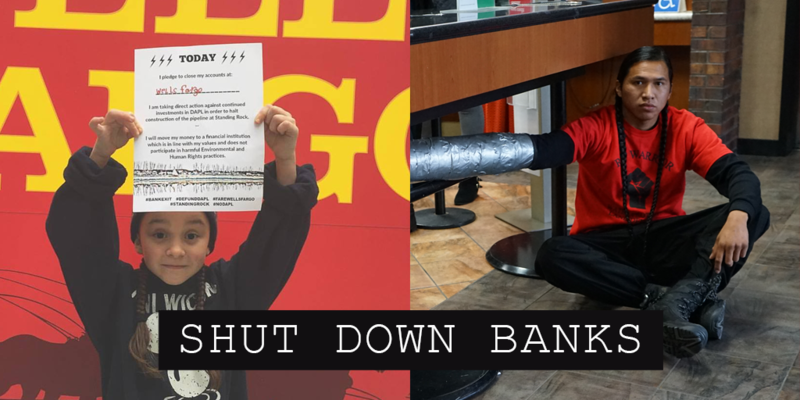 We are calling for direct actions, demonstrations and other disruptions targeting the banks behind the pipeline. We also ask that people to close their personal accounts and pressure local constituents to divest from these banks. TD Securities, CitiBank, Chase, PNC, US Bank, Bank of America, SunTrust, Wells Fargo, Citizens Bank, Goldman Sachs, Morgan Stanley, Community Trust, HSBC Bank, Deutsche Bank, Compass Bank, Credit Suisse, Sumitomo Mitsui Bank, Royal Bank of Canada, UBS, Comerica, BNP Paribas, Bank of Nova Scotia, Royal Bank of Scotland, Bank of Tokyo Mitsubishi UFJ, Mizuho Bank, ABN Amro Capital, Credit Agricole, Intesa Sanpaolo, ING Bank, Natixis, BayernLB, BBVA Securities, ICBC London, SMBC Nikko Securities, Societe Generale.